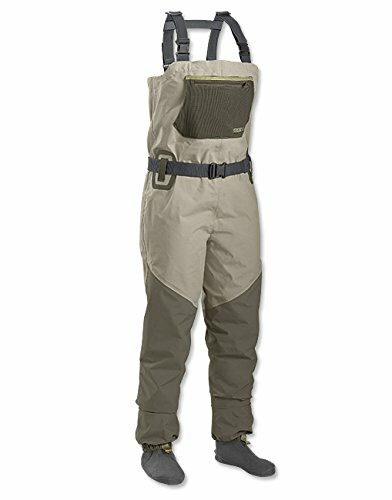 The Encounter wader is the new standard for value waders, built from a 4-layer nylon fabric that offers an optimum balance between durability and breathability. The fit has been revamped to match our award winning Silver Sonic family of waders; designed for women who fish, by women who fish. Additionally we have added a number of features that provide the angler a better overall experience, including a front, kangaroo-style hand warmer pocket combined with a mesh, zippered storage pocket for quick and easy access to critical gear. Attached, self-fabric gravel guards seal off your wading boots from sand and gravel that will shorten the life of your waders. Three integrated belt loops combine with the included wading belt provide for a safe and snug fit. Interior Velcro strip provides a placement point for our waterproof pocket (8G3H, sold separately. Anatomically correct, sculpted neoprene booties for a true fit. Outer shell: 100% nylon. Laminate: 100% polyurethane. Liner: 100% nylon. Hand wash. Imported. Regular sizes: S, M, L, XL.Petite sizes: S, M, L, XL.Tall sizes: S, M.